Among the 1,800 strong congregation were the Home Secretary, the Lord Speaker; the Speaker of the House of Commons, and the Mayor of London, as well as families of those injured and service personnel. Upon arrival at the Abbey, William laid a wreath at the Innocent Victims Memorial. The wreath, which was only signed by William, read: “In memory of the innocent lives; lost to us all on the 22nd March 2017”. During the service, William read Luke 10: 29-37. After the service, the royal trio met privately with families of those killed and injured in the attack, before meeting with first responders. Here is a video of part of the service. Here is a video of the first responders meeting after the service. For the Service of Hope, Kate repeated the Missoni “Long Snake Stitch Coat” she wore to the Somme 100 event on June 30, 2016. Kate’s hat is also a repeat, a Lock and Company hat she’s worn in 2013 and in 2014 at the D-Day commemorations. She wore the Queen’s Diamond Stud and Pearl Drop Earrings. Her shoes are Gianvito Rossi black suede pumps. Kate also wore a black dress under her coat. The only new part of Kate’s outfit was her clutch. Kate carried the Beulah London Blue Heart Clutch in black croc ($360.58). Thanks for covering this. I found the service on YouTube, it was lovely. I find it odd William was the only one who signed the wreath and Kate and Harry just stood back as if they weren’t involved. Part of me wonders if it has t odo with William’s ego. Kate looked fine. Dressed about twenty years older, and I hate that fascinator, and the super old lady chignon, but whatever. No complaints, just boring. I’ve noticed Harry’s suits fit far, far better as of late. Went to Dad’s tailor finally?! William looks hideously smug and like he can’t wait to get out of there. That was the vibe during the service, when the camera was on him. Kate had a bit of that, as well, but not nearly so much as William. He’s got no formality, no solemnity, no gravitas, just “worship me for I have shown up” even standing up there reading the Bible. It bugs. Agreed it was a lovely service. Maybe William signed as a future king. That would explain why Kate and Harry didn’t sign. Agree Ellie, and for the first time I saw Harry walking in front of William and Kate (when they are waking in the Abbey). 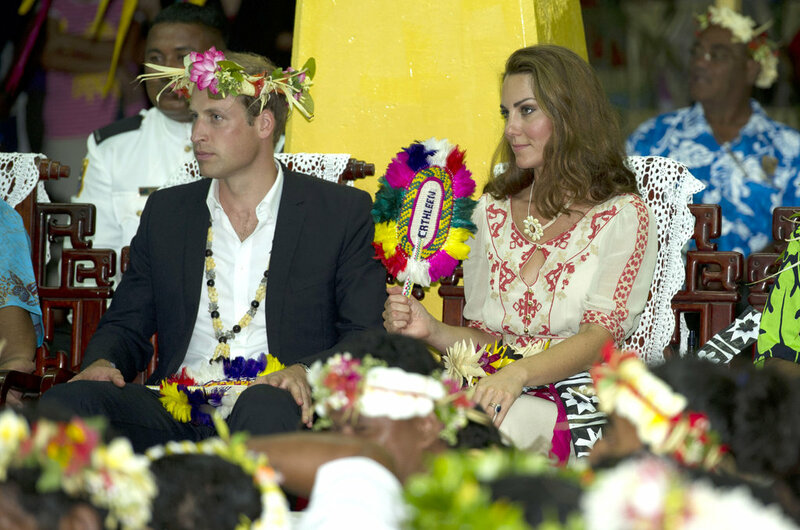 Yes, as you said William “got no formality, no solemnity, no gravitas”, I always feel he is “acting” at these events. How much difference from Diana. They walk into service by protocol. Most important person last. In this case that would be William. Most people often don’t notice that because HM or Charles are present and people are used to those people coming last. Harry and Kate walking infront of William in the church is how it is supposed to be. Protocol is a strange thing because in other scenerios, William walks ahead of Kate and Harry to signify his status, but for church, it’s the opposite. It made me laugh thst the Middletons’ christmas pap stroll got this wrong. They had William and G walking ahead per protocol when it should have been the other way around. Thank you very much for the explanation, Herazeus. So for the church the most important person comes last. It’s really a strange protocol. Firstly, it was very much an official pap stroll for W+K+ kids. Complete with protocol that indicated the superior status of W+G vs K+C. If it was a private visit that happened to include a church visit for christmas, they would have turned up the way they did in 2012. Not following protocol and W+K very casually dressed and semi-mingling with other congrants. No special treatment. And if they were going to play the protocol game, they should gave done it properly….Middletons first, followed gy K+C with W+G coming up last. As with everything they do, they insist on their status and hierachy of a system they keep insisting they are moderning, but then they follow the rules and get them wrong. There’s getting to be a touch of the Tony Blair about William. He’s turned off so many people that he could become the loveliest, hardest working and best husband in the world tomorrow and most of us would still give him the side eye. I think it’s too late for him now, public opinion has changed and I doubt he can claw it back. I doubt he cares. I always feel he thinks he won’t be king so why put any effort into it now. He’ll be able to give all the middle finger and ride of the sunshine / countryside with wife + kids + millions. I honestly think The Queen and Charles knows William won’t be king. King Henry in planning?!?? That’s very typical of British public. We love an underdog and it takes forever to turn public opinion against a person, but once it happens, it rarely reverses. No matter what the person does, the bad opinion becomes their defining narrative. And courting the public rarely changes that opinion. Very few people have managed it. If William got his act together tomorrow, people would turn around and love him. The reason being he is royal, not a politician. You can’t compare him to Blair. The reason people hate politicians the way they do is because they don’t agree with their policies or didn’t like the consequences of policies that were rolled out. Also Blair spear headed a very unpopular war. Trust me if the queen had been going off about her political views for the last 60 years people would hate her too. I just don’t find fascinators to be appropriate for something solemn like a memorial service, even if it is black. They are frivolous items and really should be a hat or nothing at all on the head. This one in particular is reminiscent of the weird one Beatrice wore at Will and Kate’s wedding. However, I don’t know if this is applying a North American sensibility since fascinators are not a thing here in general, or if it is Kate misjudging the occasion. Really a new bag was not necessary. She has enough of everything for all repeats on something like this. I agree about the fascinator. A proper hat would have been better. I thought the wearing of a fascinator by some women, especially Kate, was too frivilous for such a solemn occasion. I guess that is the Yank in me. I did not like the coat the first time I saw it, but this time, I felt it was appropriate on the Duchess this time. I guess it grew on me! Part of me thinks that it is a matter of William being so stiff and not wanting to show too much emotion that makes him seem uncaring. 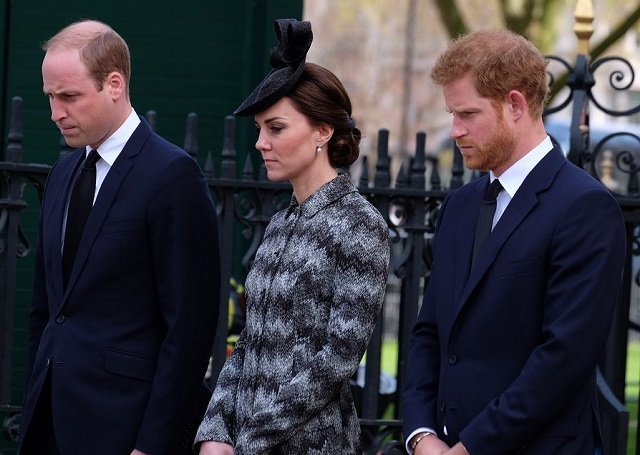 I do believe that the three — William, Harry and Kate — had a sense of compassion and concern at the service. Harry’s face is easier to read. He cannot hide his emotions. He looked so sad so many times. And, Kate seemed sad, too. I believe that William also felt compassion and care. I just think he’s so tight that it’s hard for him to show it. I hope I am right about that. The service was beautiful. Those who lost their lives, those who were hurt, and the first responders really deserved to be honored. The police acted so bravely and quickly. Everyone’s nerves were shattered that day and now people will continue to be on edge, but will fight through it. Bless all! Oh, yes Those hats are rather frivolous and more in line with weddings or garden parties. Otherwise, I think Kate looked fine. I am not a major fan of the coat, but it was suitable for this event and her hair pulled back was, too. I agree that William is rather stiff and does not want to show emotion. He had to feel for those who experienced losses and for the brave people who helped, though. And, Harry is far more able to show his concerns. Kate’s looks were appropriate. It is a good thing that this service occurred. A way to honor the losses and pay tribute to the loved ones and to those who helped. Such events help the healing process. I hope nobody forgets the tragic events like this one that occur all too often.. It is a very scary and sad time to be coping with such tragedies on such a consistent basis. William has no problem showing emotion around some other members of the BRF, nor does he hold back on PDA with them. I agree. I don’t like fascinators either, unless you are going to a silly hat party. There have been some beautiful fascinators at Ascot, but many more silly ones. Kate looks ok, she does dress about 20 years older than she is though. I get a laugh out of the expression on Williams face in the 2nd photo from the bottom. He looks as if he is wrinkling his nose after passing gas. Lol. Exact thing entered my mind about William in the second photo!He really looks like one unhappy person.I know his mother talked of her struggles with depression,but she certainly showed compassion and a real interest in the people she was with and the events in which she took part. My first thought was “Oh, no, not the snake coat!” It reminds me of a line from a show (Scandal) in which the advice is given to never where pinstripes on television because of the way they wiggle. As for the fascinator I’m on the fence. Love the earrings though. Also, you know how we talk about vocal coaches? I wonder if it’s possible to have someone coach you in facial expressions because William really, really needs one. His resting face just screams something peevish. Yes. You can be media trained to control your facial expressions. I don’t think William likes being on display in the UK hence the peevish expressions. He was all smiles and happy countenance in NYC. It was remarkable. It even made him look vaguely attractive. What? He hates his own country that much? I don’t get it. No he doesn’t hate his own country at all, he just enjoys going to the a basketball match in the USA more. His countenance on the entire NYC trip was so changed from his usual peevish self in the UK that royal reporters remarked on it on twitter. As they arrived from the airport, they were all chattering about the pointlessnes of standing outside to greet them because they were so used to the peevish expression, clenched jaw and rushing past them. They were all surprised that he stepped out of the car and not only smiled at them, but also stopped to have his picture taken. Even Kate was surprised because she started walking and turned to see where he was and turns to smile and pose with him. For rest of trip, not just the basketball game, he is smiling, happy and pleasant looking. And that is something the reporters kept discussing amongst themselves. William is not just smiling, he is acknowledging the reporters who all discussed the usual experience on twitter. They commented on his countenance entire tour. All were surprised and kept saying thst it was unexpected and unusual. They invited themselves on this tour, and so they got the luxury NYC vacation they wanted, so no doubt they were happy. That and us Americans grovel to them like they’re the Second Coming. In London, they are royalty-things are expected of them, and they are expected to behave a certain way. A very moving service and a difficult day for many, thoughts and prayers to all that were affected and the terrible heartache that will follow, such a horrible senseless thing. Thank you KMR for todays blog. The pearls are a win, very pretty, and hair a plus I like the style, neat and a little different, it has been done like this before but I think it suits the Duchess. I’m glad that there are church services for people who suffer through such senseless tragedies. I will just say about the three that Harry looks much healthier, I don’t know of course ,why. Whereas William looks the opposite, very tired, but perhaps, he had a bad day. A moving and very sad service. Not sure these three have the gravitas for this sort of event but am more annoyed by the way the media makes them the lead when reporting on this service. Something similar happened in Paris, when K&W were there after the Orly airport attack. ‘Brave royals defy terror threat’ was basically the lead for some papers, which I thought was pretty gross. I don’t mind this look on Kate, it is very appropriate for the occasion. My only issue is that she bought a new bag when she has so many similar looking clutches in black. It was a moving service, i’m surprised more senior royals weren’t in attendance. I think this is an attempt to clear up William and Kate for their past work ethic .They have been showing up frequently these days. The palace wanted to focus on W& K so others were absent . This service was scheduled after Charles and Camilla’s tour, so they couldn’t go because they are in Italy right now. Ok just looked it up. Wow. I’m so shocked that Camilla and Charles would breach protocol like that. That’s something I would expect from Kate, not C and C.
For those that might not know what we are tking about, Le privilège du blanc or the privilege of the white refers to the Catholic tradition that only designated Catholic queens and princesses can wear white during an audience with the pope. Given that Camilla is not a designated Catholic queen or princess, she should have worn black. Camilla is Princess of Wales. Pope Francis has relaxed the ‘privilige du blanc’rule. It seems he relaxed it some time ago because when the Queen met him last year (i think) she was not wearing black as she had done in previous years. It looks like cream or off-white to me. Thanks Sarah, I would have been shocked to find Camilla had broken a dress code like this. That makes sense. Camilla is very good about things like that. So good for her for wearing white/cream and there being no dress code. I’m glad the Pope has relaxed the dress code for a modern time, but the fashionista in me regrets the loss of those elegant outfits. Remember how wonderful the Queen looked in the 1980 visit with black taffeta gown and black veil held by a tiara? We would never have seen that outfit except to visit the Pope. Sorry, I can’t post the pic. It was gold, and the relaxed protocol is what Pope Francis requested. I do like the black outfits though that are traditional. I’d probably do it anyway as a respect thing. Don’t like that coat, but doesn’t matter. Very appropriate look for the service, and love the earrings and pretty hairstyle for the service. I thought William did a very nice reading, and was solemn throughout. I think his resting expression can be confused with one of annoyance, but feel he, Kate, and Harry really must feel awful about what happened in their beloved city. One of the victims was going to school to pick up her child. Stuff like that hits anyone in the gut. It’s so obvious that compared to Harry’s natural rapport with people, W&KM are not gifted in meeting people. We know W can be relaxed from the photos and videos of his recent ski trip, just not with the public. It seemed that KM was looking to Harry for support when they arrived and throughout the ceremony. W did not look at her at all. And did KM barely acknowledge the woman in the fascinator after she had spoken to the men in the receiving line? I agree that W&KM don’t have the gravitas to lead these types of ceremonies. But then I see the first responders, the victims, the police, the hospital staff and others who reacted to this tragedy as the real nobles. Spot on, Indiana Joanna, and well put. If I were these 2 wastrels I would feel shame looking at the dull detritus of my shiny life. I think William is this generations CG as far as grumpy demeanors go. Harry has the “it” factor and his affable personality have allowed him to skate by. I’ve often wondered if the roles were reversed if their personalities would be the same. Kinda like the chicken and egg. Is William intrinsically a grumpy sour puss or did his title make him that way. If Harry was the heir and not the spare would he still be his jovial self? It depends who you talk to. William fans say that his future duty as king has made him much more reserved and uptight, and Harry has more freedom and can therefore be more jovial and relaxed. Harry fans will say it’s all down to innate personality and position within the family has nothing to do with it. Look at Andrew. My opinion is that it’s probably a little bit of both. We are all born with certain personality traits, but our experiences definitely help shape our personality and behavior as well. Ken Wharfe, their childhood bodyguard said that William was like this even as a child. Harry was always the easy child who was relaxed around people whereas William was always unsure and tense. Moreover, he also described William as a ‘sly’ child who wasn’t easy to deal with. Various people from his childhood have described him further as a very secretive child. His teachers and classmates had the bully side of his personality. It earned him the nickname ‘Billy the basher’. It’s unclear when he learnt that he would be King, but it seems to have made him even more intolerable because he would threaten to sack staff who displeased him as a routine task of his future kingship. Did his destiny calcify his personality? Probably, but he is not the first heir to know his destiny from an early age, and it’s unfair to blame his dour personality on his fate as if he were the first heir destined for that position. Didn’t he threaten to execute people as a little kid too? I’ll be King, I’ll have you beheaded! Diana and Charles thought it was funny but HM was pissed at William’s awful behavior. Well Hera, things change for a reason. Do you ever think Maybe William was never meant to be King? Part nature and part nurture. The huge level of privilege lavished on William (and all Windsor’s come to that) atrophied his character development. The result is a man who cannot function on his own abilities outside the artificial bubble created for him. William is at once hamstrung by the suffocation of expectations/role and a beneficiary of privilege that he would never be able to earn on merit. 3. Give the illusion of (2) while really hooked into (1). William seems more (1), other Windsor’s closer to (3). There are always so many excuses made, that the burden of future kingship destroyed William, made him reserved, is to blame for it. Many royals are raised in the lap of luxury and don’t shut down as a result. Willem-Alexander and Felipe are only two examples (there are more) of those who work hard to get the job done, even when they do end up making mistakes. They haven’t turned into petulant, defensive, bashing men. Strong edge to Felipe here, because he is smart enough not to make big mistakes regarding vacation properties (that we know of). W-A was the product of a loving marriage which included a father with serious depression issues, one who was often unhappy with the limits his spouse-of-monarch role placed on him. Felipe is the product of a dysfunctional, PR-sham of a royal marriage, an unhappy image-conscious mother, and a philandering father. I think she was dressed appropriately for the occasion. It was a nice look overall. They certainly caught them with some unusual expressions, but at least they weren’t laughing and joking at such a solemn occasion. That was my thought, too, re. not smirking with private jokes as Kate and Harry have been known to do in the past. They’ve clearly been counseled to act more appropriately. Kate looks so strained in such a matronly outfit; I really think an elderly courtier has been put on her detail to advise, but it’s too old a look for a 35-year old. The fascinator is a ridiculous concoction for anyone; no-one looks good in them – they serve no function, except to look ridiculous. Wear a hat, or nothing. I am also one who thinks that William’s inability to relax in public and show any kind of emotion is what some confuse with his disinterest — or lack of caring. Harry is more like Diana and can express himself better, even when he’s not speaking His face was the easiest to read. Ugh, that fascinator. So inappropriate for such a solemn occassion. Still, I am not going to complain too loudly. Kate seemed “present” and while the snake coat is not one I really appreciate, it did look fine for the occasion. All black would have been too much. There needed to be a sense of “hope” in the service. I am very pleased that such a service did occur and that people who died, people who were hurt, the loved ones and the police and medical reps were honored. This brought people together and was a dignified and respectful ceremony in the Church. My heart goes out to all who were affected. I still remember reading Birdy’s comment about how worried she was when she could not contact her loved ones. It is a blessing that all are well for her and others. My prayers to others who did not have such good fortune. Some candid shots of Kate leaving Pippa’s house. Since she doesn’t have any engagements scheduled until May perhaps her and William will go somewhere to work on their tans before the wedding. Bad boy Spencer is hotter than the groom! I always loved that name. I think if Harry has a son, he should name him Spencer in honor of his late Mum. I assume that would not be allowed, however. Too bad. Love that name! Prince Spencer?? Can’t say I’m fond of that but I think Harry will name his daughter Princess Caroline Alexandra Frances to match Princess Charlotte Elizabeth Diana. *Caroline for Charles/Charlotte NOT Carole. I love the name Caroline; we need a Princess Caroline. But I think Catherine may want it in case she has a 2nd daughter (or even Pippa). She apparently wants one more child but William doesn’t. Even if Carole wasn’t the name of granny, there was a very popular Consort, Caroline of Brunswick, in the royal family. Married to George 4. Apparently as popular as Diana in her day. Definitely more popular than her husband though given he was hated by everyone, not a difficult accomplishment. I think their daughter is already named after Carole Middleton. Charlotte is a derivation from the same root as Carole. I can’t see him picking a name that close to Carole. I hope he’d avoid Diana and Frances too. Don’t condemn the child with a name. For people who think Kate doesn’t use wiglets or extensions, look at those pictures. Her hair isn’t the thick, big volume you see when she’s doing engagements. Nothing wrong with her own hair, but it’s ridiculous that she adds so much volume to it. Exactly those extensions look vain and ridiculous on her part. She has hair that looks just like everyone else’s regular hair- so why the need to show herself as some goddess who can still have lovely, thick hair, even after all the dieting and smoking that she has done? Moreover, pregnancy and post-pregnancy can wreck havoc on your hair too- I know mine has not recovered the thickness that I used to have and its been a few years now. Good point Herazeus, I go back and forth on whether Kate uses extensions. But when she is photographed just out and about her hair isn’t nearly as thick. I don’t get why she always puts in extensions. She has nice hair without them, just not as much volume. We don’t know that they won’t do anything more in April, they just haven’t announced anything else for April yet. They usually announce engagements 1-2 weeks in advance. There are three weeks left in April, so plenty of time for KP to announce more engagements. And since the London Marathon is April 23, they will most definitely have more engagements in April. They just haven’t announced them yet. Thanks for the link Queen Lauri :). I love candids. I find it odd that nothing has been scheduled yet. Especially since this is their big Heads Together month. They will be doing something around the marathon, but that isn’t even on the schedule yet. In almost every picture, her hands are on that hair of hers. All of a sudden? Why? She has to sometimes act like she doesn’t want her photo taken :). In a few of those photos, she is trying to hide her face, but still smiling. The Middleton sisters are dreadful actors when it comes to photos. They love the attention the camera brings and have always had an awareness of when it’s there. Kate’s pretense of hiding her face behind a phone – really? – is just faux concern for ‘privacy’. She’s not “hiding her face”, though. She’s running her fingers through her hair. When the photos are viewed in order as she’s coming out of the house, it’s clear that she’s lifting her hand and then running her fingers through her hair. I don’t think so. I think she’s just running her fingers through her hair like she and so many other women do. The photos were taken in the probably 30 seconds it took for her to exit the door and walk to the car. Yes, she’s running her fingers through her hair, but it’s for all of probably 30 seconds which isn’t weird. She used to dress so cute during the gf years-whatever happened. Are these the only pants she keeps in London? I have. I don’t think it’s weird. It’s not the most natural thing to do, particularly with a larger phone in the hand; any of your suggestions make more sense. Kate’s clearly aware a camera is there, hence the slight smile/ smirk, depending on your take. I’d imagine Kate has a large wardrobe of skin-tight pants at her various abodes; it’s obviously her go-to preference in most situations, and to be fair, she is on her own time here. She looks her age in these pics, which is good to see. Interesting to see the hair without extensions; it looks better too. Very appropriate outfit for today’s engagement. My only compliant is the line of blusher on her cheeks, I wish she would learn to apply it correctly. I got my wish with the updo but I don’t like the hat. Eyeliner of doom has returned, too. Thank You KMR. For someone who supposedly does botox and filler, I would think Kate would also have fillers around her mouth to get rid of the folds making her her mouth appear downturned. I think her choice of clothing was appropriate and thank goodness that hair was up. At this point, even if her chignons appear matronly, I am just happy to see her not looking like Cousin Itt from The Addams Family when she is at an event. 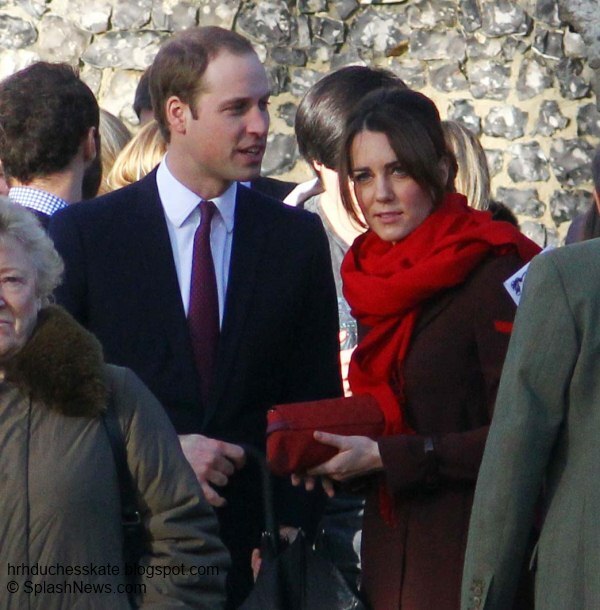 I thought Kate looked very well put together for this service. Tight and tidy, as it should be. Small thing, when she is doing “solemn and serious” she often crosses the line to “in a rage and someone’s about to get it”. Sort of how my son looked when getting passport pics done this last time. He can’t do blank and serious without looking *mad* – and this is a guy who rarely does mad, so it’s kind of funny. She looks really cute here; no William. It is amazing Jessica how much more relaxed and happy both William and Kate appear when not in each other’s company. Queen Lauri, I saw this and thought of you. It’s a posture trainer device that needs a little funding. Maybe instead of buying another hideous outfit, Kate could spend the money on this! LOL! PS – KMR, please delete this if this is inappropriate. Awww, thanks for thinking of me!! Lol, I’m buying a dozen and having them shipped to KP stat!! This is off subject, but I just realized something regarding the Tuvalu Order Kate and Will are getting. Tuvalu thought Kate’s name was Cathleen. I remember one country giving her the wrong name on that tour but didn’t realize it was Tuvalu until now. I don’t know why, but I find it funny that they didn’t even know her name when they visited and now she is getting an order. Kate looks twice her biological age here. Did you know that they released new videos for their head togethers iniative? I think it shows how terrible their pr/social media team is that none of the Royal reporters seemed to pick it up or retweet it. They all seem to be covering the Charles Camilla tour so why not wait until they get back? I clicked on dm and the only story they appeared to have was the Kate leaving pippa’ house. I think that’s a wee bit interesting. There has been a concerted effort by the royal reporters to ignore WK’s social media posts. It’s hit and miss policy because it makes them look like they are picking and choosing what they pick up vs what they ignore. The KP posts that are given to AP tend to be picked up and rest ignored.